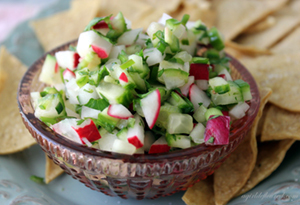 Wash and chop radishes, cucumber, scallion, chili, and cilantro. Add to bowl with garlic and lemon juice. Season with salt and pepper. Mix thoroughly. Taste and add more chili, lemon, or salt as needed. Let sit for 1-2 hours for best flavor. Enjoy!